WordPress 5.1 will feature a new parameter for register_taxonomy(), 'meta_box_sanitize_cb', which increases flexibility when using core UI for custom taxonomies. Custom taxonomies can specify which metabox UI they’d like to use in the Classic Editor by providing a meta_box_cb parameter when registering their taxonomies. This meant, for example, that a hierarchical taxonomy can choose to use the post_tags_meta_box() UI instead of post_categories_meta_box(), which is the default. Prior to 5.1, this customization wasn’t fully functional; while the UI could be swapped out in this way, the data submitted when saving posts was always processed according to whether the taxonomy was registered as hierarchical. This led to scenarios where custom taxonomy values weren’t properly parsed when saving a post. The POST controller logic that was previously hardcoded in edit_post() has been abstracted into the new taxonomy_meta_box_sanitize_cb_checkboxes()and taxonomy_meta_box_sanitize_cb_input()functions. WP will try to select an appropriate _sanitize_ callback based on the meta_box_cbassociated with the taxonomy. This will fix the underlying bug for existing taxonomies. Developers who need more control over the processing of their metabox data can provide a custom meta_box_sanitize_cb when registering their taxonomies. For more information, see #36514 and . In WordPress 5.1, the new human_readable_duration function will be introduced. This function accepts a duration in hours, minutes and seconds and returns a “human readable” string appropriate for screen readers. The function takes a string representing a time duration, with hours, minutes and seconds separated by a : (colon). For example, calling human_readable_duration( '3:10' ); will return 3 minutes, 10 seconds. Minutes and seconds are required. For 10 seconds, the call would be human_readable_duration( '0:10' );. Improved time duration accessibility in the media library using the human_readable_duration() function. Update (2019-03-04): The fatal error protection mechanism explained here has been pulled out of the 5.1 release as it had several flaws critical enough to postpone the feature. A new path to address the issues is underway via #46130 and is intended to be released as part of WordPress 5.2. Update (2019-01-21): A few critical naming changes have been made regarding the fatal error protection since the post was originally published. Most importantly, the drop-in to override the new shutdown handler is now called fatal-error-handler.php, and the class to override is called WP_Fatal_Error_Handler. Furthermore, a new WP_DISABLE_FATAL_ERROR_HANDLER constant allows entirely disabling the feature via wp-config.php. The rest of the post is also updated to use these new terms, however you might need to update your code if you built anything based on the previous information. For a history of what exactly has changed since the original post date, please refer to the umbrella ticket #44458. WordPress 5.1 will start showing notices to administrators of sites that run on long outdated PHP versions. This part of the Servehappy and more globally Site Health projects paves the way to a more secure and performant web and, more specifically to WordPress, to a bump of the minimum required PHP version. The current threshold for which PHP versions to display the notice will be anything below 5.6. While the lowest PHP version still receiving security updates is currently 7.1, the idea is to not go all the way there at the beginning to limit the support load. PHP 5.6 is the intended version to bump WordPress requirements to, and from then the threshold for the PHP notice will increase granularly, with the goal to over time catch up with the actual PHP version progress. The threshold is managed via a new Servehappy API endpoint on wordpress.org, so the version numbers can be modified independently of a WordPress release. For further background information on these changes, please refer to the respective tickets #41191 and #45686. To help the process of recovering errors that result from updating the PHP version, a mechanism has been implemented to detect fatal errors and, in certain designated areas of WordPress, recover from them. While updating PHP is mostly fairly straightforward and popular plugins and themes are typically maintained well, not necessarily all extensions are compatible with the latest PHP versions yet. So unfortunately there might be cases where a plugin or theme causes the WordPress site to no longer be accessible after the PHP update by causing a fatal error. With the so-called WSOD protection (white-screen-of-death protection), WordPress will recognize when a fatal error occurs and which plugin or theme is causing it. When accessing the admin backend, the respective extension will be paused, allowing users to still log in to their site so that they can (at least temporarily) fix the problem. Once the extension is known to be fixed, it can be resumed from the backend. While this does not necessarily make updating PHP easier, it lowers the burden of possibly running into the case where you are completely locked out of your site when you do not have access to the codebase. 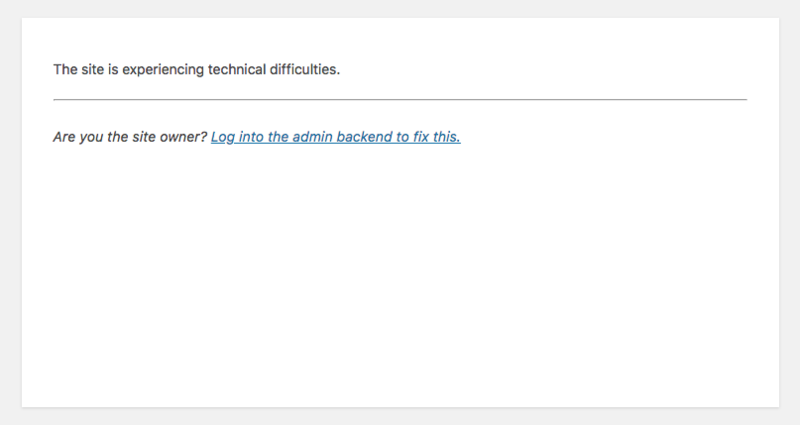 Extensions are only paused in the admin backend and a few other areas while for example the frontend stays unaffected, and thus broken. Since it is impossible to predict which functionality the broken extension is responsible for, it would be dangerous to have it disabled in the frontend. It is more clear to a user accessing the site to see a message that it is currently not accessible rather than, without notice, no longer having access to a certain part of the key functionality. In the frontend, a message that the site is currently inaccessible will be displayed via a regular wp_die() call, with a link to the admin backend. Sites that would like to modify this output can use a new php-error.php drop-in that should send the necessary HTTP header as well as the output. For sites that prefer to alter this behavior or sites that would like to omit the WSOD protection altogether, it is possible to add a new drop-in file fatal-error-handler.php. That file should declare a custom shutdown handler class for treating fatal errors that extends the default WP_Fatal_Error_Handler, and then return the instance of it to use. The default class’s functionality is split into distinct methods so that it is easy to reuse and override as granularly as necessary in a child class. The functionality can also be disabled entirely if that is preferred, via a new constant WP_DISABLE_FATAL_ERROR_HANDLER or, more dynamically, a corresponding wp_fatal_error_handler_enabled filter. For further background information on these changes, please refer to #44458. 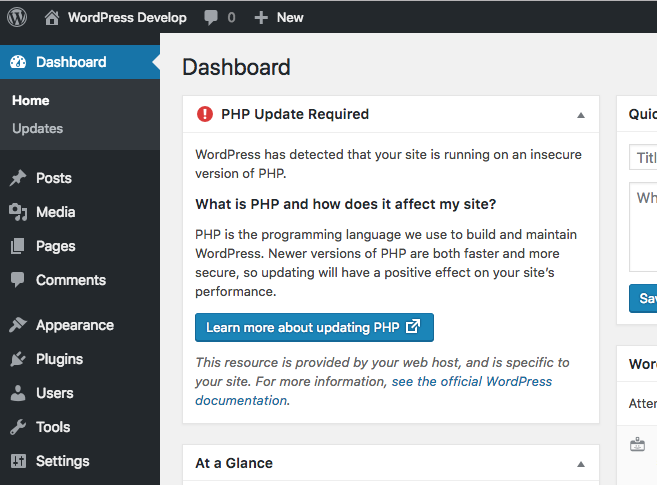 When browsing plugins to install, WordPress 5.1 will display a warning for those plugins that require a higher PHP version than the one currently active. While that screen previously already included such information about WordPress version compatibility, it now does the same for PHP. Furthermore, for both of these potential issues, WordPress will now enforce these requirements, disabling the button to install such plugins. This is only a first step in enforcing version requirements of plugins and themes. In a future WordPress version, these restrictions will expand also to updating or activating plugins and eventually cover themes as well. For further background information on these changes, please refer to #43986. In WordPress 5.1 the admin table pagination links have had their CSS styling modified. This CSS change improves the color contrast ratio for better accessibility and improves consistency across the admin screens. The pagination links are now styled like the standard WordPress buttons. By default, they have a lighter background color. The background color will no longer change to blue on hover and focus. Plugins and themes should not be affected by this change unless they are re-using the .tablenav and .tablenav-pages CSS classes. All plugin and theme developers should verify that this change does not affect them. Edit: On January 14, 2019, the Good and Bad Practices section was added to show both correct and incorrect code examples. Starting in WordPress 5.1, if register_rest_route() is not called on the rest_api_init action hook, a “doing it wrong” notice will be triggered. This notice is being added in an effort to encourage best practices when registering REST API endpoints. First, let’s look at what happens when WordPress loads to set up the REST API and explore a few reasons why this pattern is beneficial. WordPress does its best to ensure that the REST API is only loaded when a REST request is being performed. To do this, the rest_api_loaded() function is run on the parse_request action and checks for a value in the rest_route query argument. This argument is populated with a value when the Rewrite API matches a WordPress REST API URL. When a value is present, the rest_get_server() function is called to instantiate the WP_REST_Server class, store it for use across WordPress, and to run the rest_api_init action hook. When register_rest_route() is called, it invokes rest_get_server() to retrieve the global WP_REST_Server instance created in the bootstrap process. But, if the instance has not been set up yet, it is instantiated then and the rest_api_init action hook is run. This means that every function added to the rest_api_init hook will fire at that time. This could result in a large performance hit. For example, say register_rest_route() is called on the init action, or, just called in a theme’s functions.php file. The REST API server would be set up for every WordPress request, even those that are not actually aimed at the REST API. If register_rest_route() is called too early, it’s also possible that endpoints will go missing and never be registered. This happens when other plugins are not given the chance to register their rest_api_init hooks. For example, say register_rest_route() is called directly in an mu-plugin file. This will cause the REST API to be set up before regular plugins are run, so their rest_api_init hooks will not be registered. Let’s look at a few code examples and detail why they are good or bad. In this example, register_rest_route() is called directly in a file without being attached to an action hook. This means the function will be called as soon as the file is loaded by WordPress. All of the potential issues detailed above are possible, and a _doing_it_wrong() notice will be triggered. In this example, register_rest_route() is correctly placed inside of a function that is added to the rest_api_init action hook. It will only execute when the rest_api_init action hook is executed. The potential issues detailed above are avoided, and no _doing_it_wrong() notice is triggered. All plugins and themes should double check that their REST API endpoints are being registered correctly using the rest_api_init action hook. This best practice is also mentioned in the Routes and Endpoints section of the REST API Handbook. If this was a resource used when developing, chances are you won’t have to change anything! Because some unit tests require custom endpoints to exist, it is not uncommon for a test method to call register_rest_route() directly. If a test method calls the function before rest_api_init, a previously passing test method may now fail. This can be fixed in two ways. The first way is to use rest_get_server() to create the WP_Rest_Server instance for your tests. Since rest_api_init is run within that function, this will prevent the notice. This approach can be seen in the Tests_REST_Server class. The wp_rest_server_class filter still allows you to replace the default WP_Rest_Server class with your own for testing purposes with this method. The second way is to call do_action( 'rest_api_init' ); directly in your test method or setUp() method. This method is for scenarios where complete control is needed over the REST server setup process. This can approach can be seen in the Tests_REST_API class. You can read more information about this change in the ticket on Trac.